It’s time to get the seats ready for installation. First, we need some spacers. 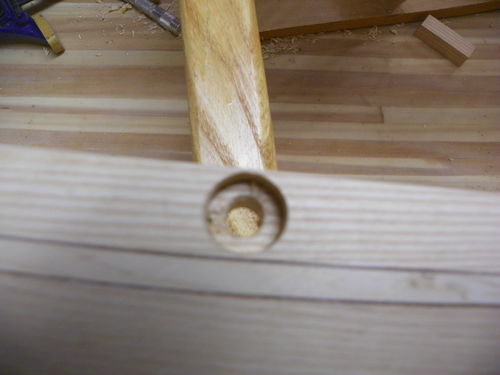 Big dowels will work, but I like to use left over pieces from the gunwales. We need eight of these. Two will be 4”, and six of them will be 2 1/2”. These lengths will be tweaked later. 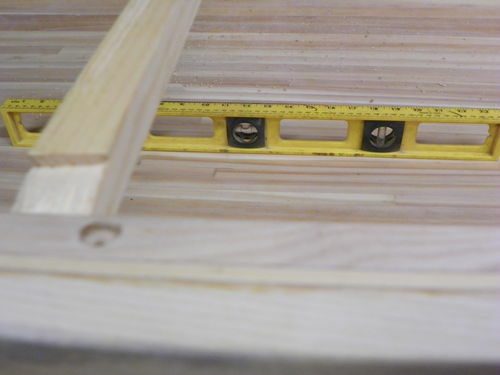 They are held in with 1/4” carriage bolts. 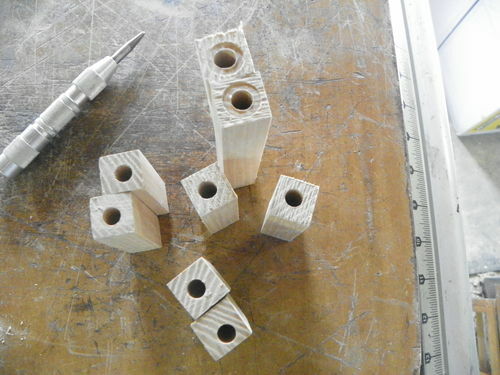 The spacers need to be drilled through with a 5/16” bit. 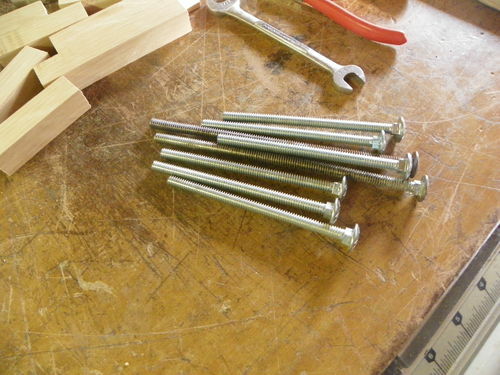 The bolts needed are two at 6”, and six at 4 1/2”. I’m doing the bow seat first. 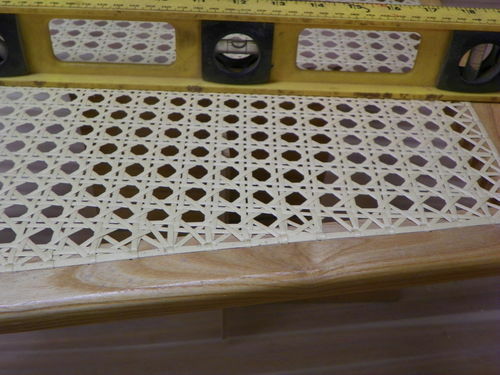 The book suggests the front edge of the seat be 40 to 45 inches from the point. That seems to work well for me so I will do it with this one. Now to get it even side to side. The tape marks the center and gives me something to measure from. 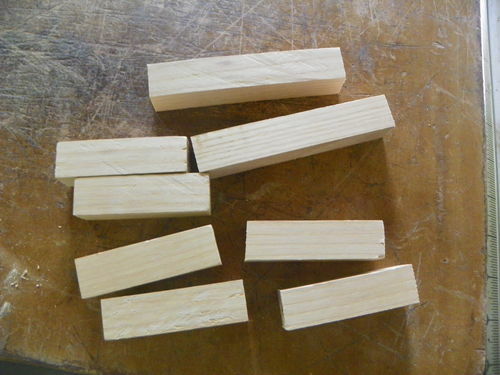 Now I need to mark the four pieces so I will know where to make the cuts. 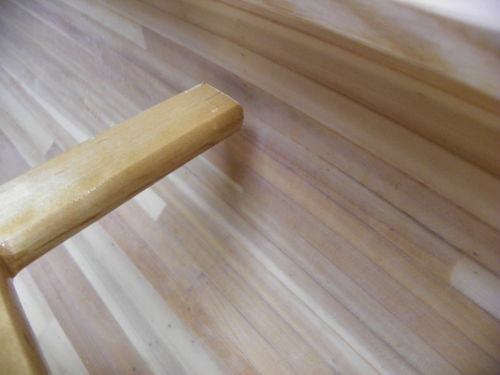 Without bumping the seat, carefully mark the top of the piece just about at the inside of the cedar hull. 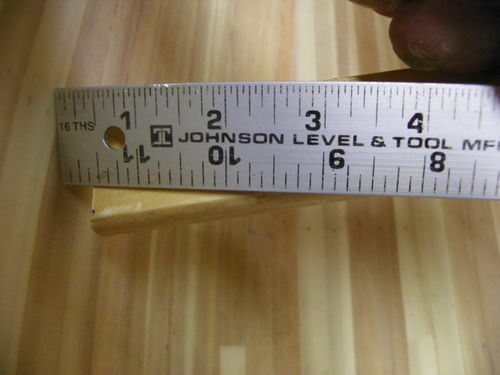 This should give you the right length. 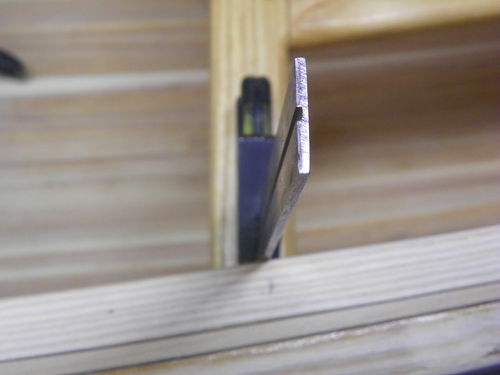 Make a mark on both edges and connect them with a straight edge. 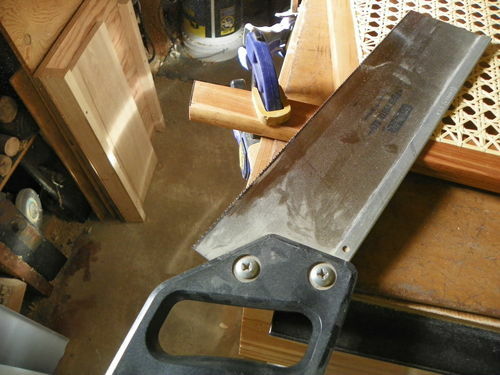 I use a backsaw to cut this. 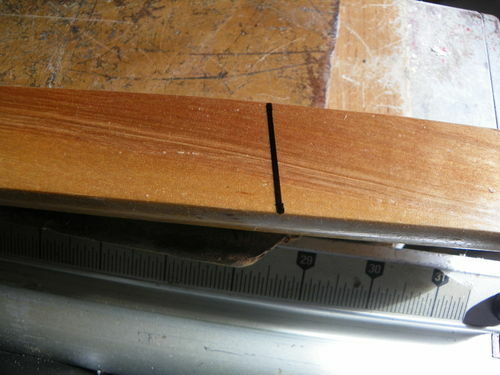 I cut very carefully and try to bevel the cut in from the top because the canoe has that shape. 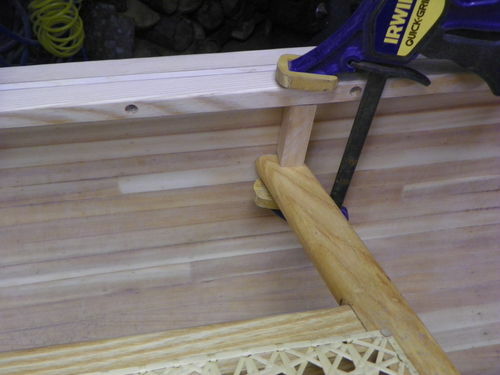 If you cut it square the end will not touch the canoe correctly. OK, with all that fussy stuff out of the way it’s time to put the seat in. Too bad I cut it wrong. It didn’t hit within 3/8”. I hate when that happens. 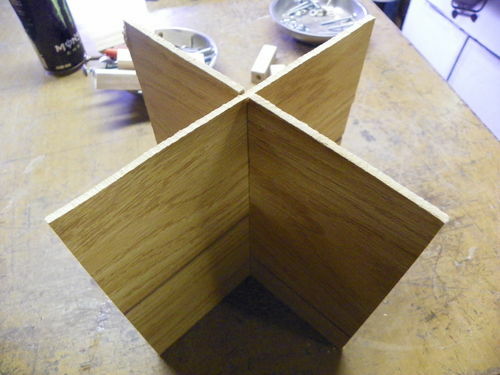 I did some figuring, recut some of the ends, and made it all fit. Too bad the seat is now too close to the point. You all know the saying, you can cut wood off but you can’t put it back. Normally I would be a little grumpy right now, but I have an ace in the hole. 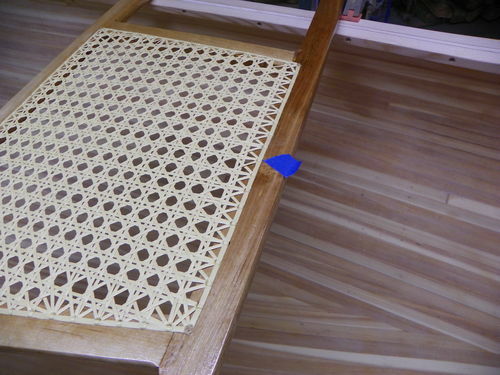 When I was weaving a seat for another canoe a couple of years back, the wife wanted to try it. She wove a seat right along with me. I didn’t end up needing that seat so I put it away where it wouldn’t get destroyed. I got it out and it looks like a perfect match. 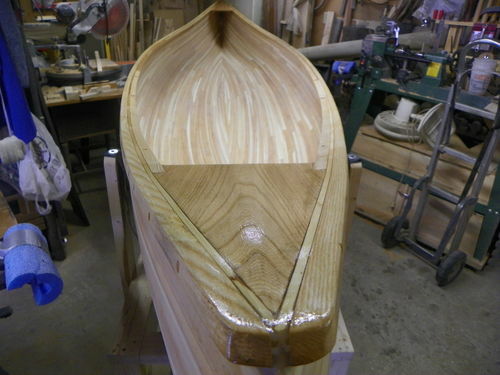 I remember now, you have to allow for the shape of the hull a few inches below the gunwales, I had marked it with the seat frame up against the bottom of the gunwale. What a doofus! 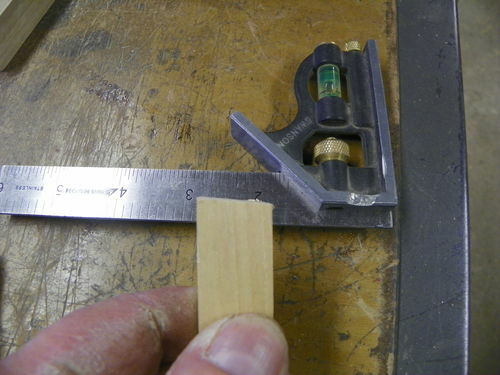 I marked this one correctly, and cut it, and put it in. Now to fit the spacers. I grabbed a scrap piece of paneling and made something to help hold the seat up. Next, be sure the canoe is level. Now clamp the seat in place and check that for level. As you can see it’s off about 9/16”. This means you have to shorten the rear two spacers about 9/16”. Worked out fine. 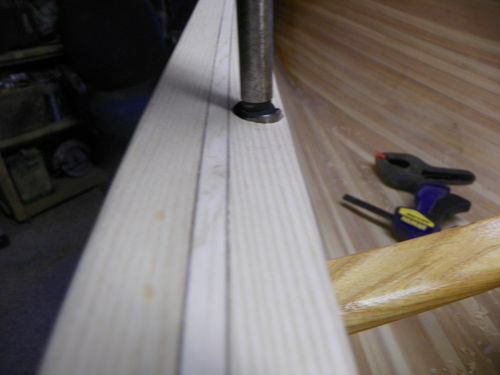 Now I use a small square to help mark the gunwale as to where to drill. 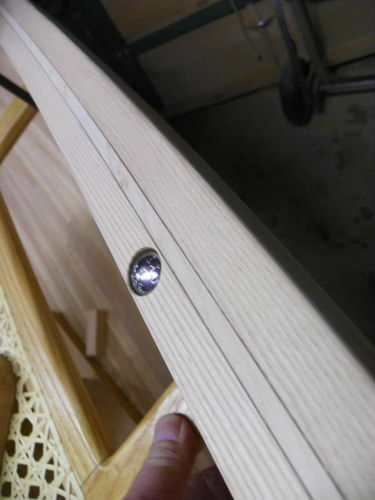 The seats are held in with carriage bolts, so I need to make a countersink for the bolt head. I use a forstner bit for this. Now I drill through with a 5/16” bit. 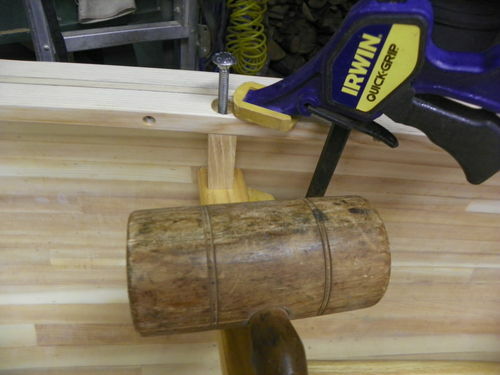 Next clamp everything in place and smack the bolt heads with a mallet. 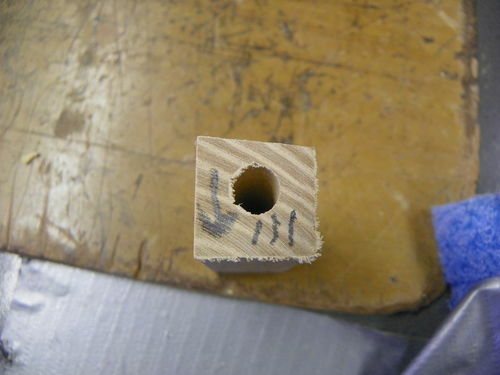 This will give you a dimple so you know where to drill. 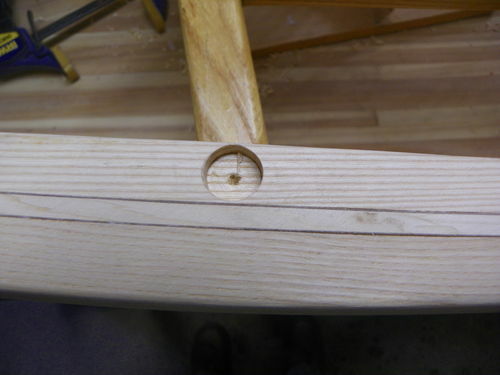 The gunwales are not really flat, they tip in slightly. 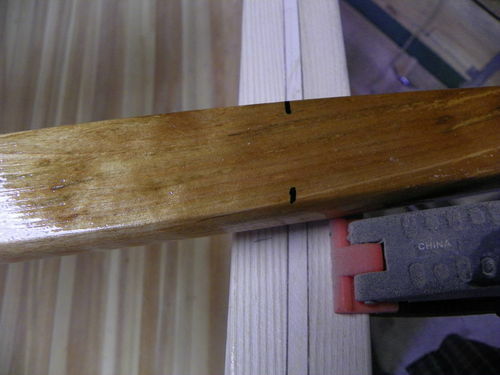 In order for the spacers to fit tightly you need to sand a bevel on them. And, of course, they are not always the same. The best way I have found to deal with it is to mark them, I put an arrow pointing to the hull side, and number them. 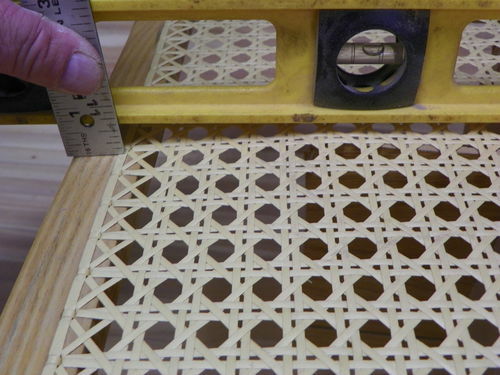 I do this on the end, that way when I poly them I can see it but not after they are in place. 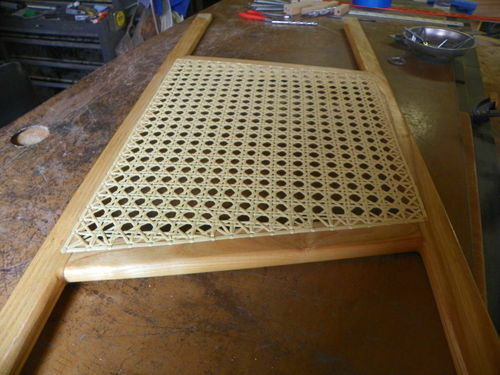 So, I have gotten through both seats and the spacers are done. 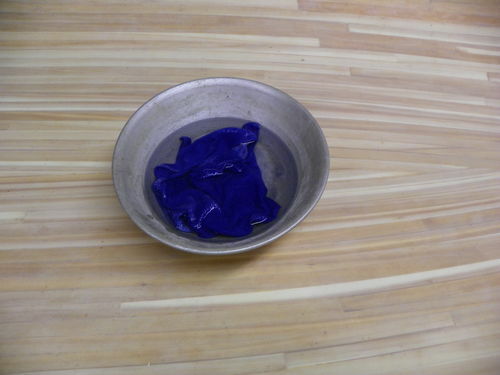 Now I want to get on two coats of poly before I quit for the day. 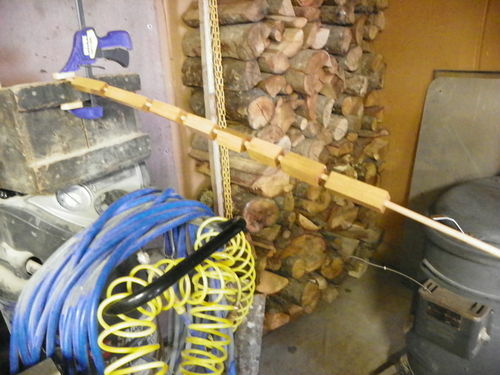 I put them on a dowel near the wood stove. While they are drying I have another big job to do. 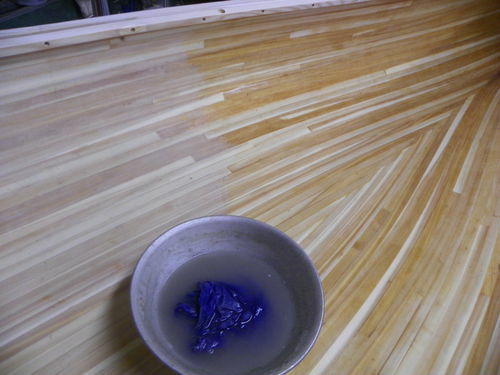 The book says you need to wash the entire hull with water before putting on the poly. 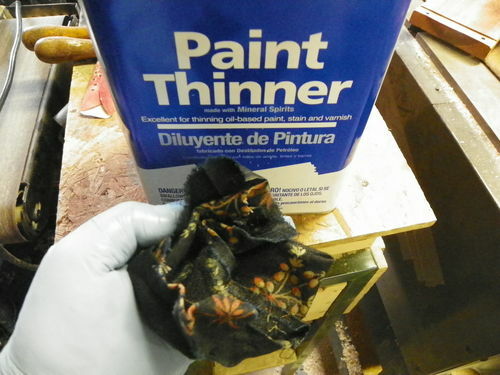 The author says if there is any leftover dust from sanding the fiberglass the poly will not dry and it will make a mushy mess. He says he found this out through experience and I’m not willing to find out for myself. So wash it is. The next job is to wipe it down with paint thinner. I have washed the hull, wiped it with thinner, and polyed the spacers. 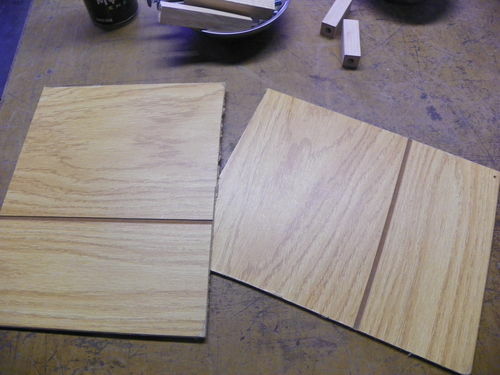 I have a few minutes to kill so I polyed the decks and the gunwales. By then I could do the second coat on the spacers. With that done I’m calling it a day. I hope to get out there tomorrow. 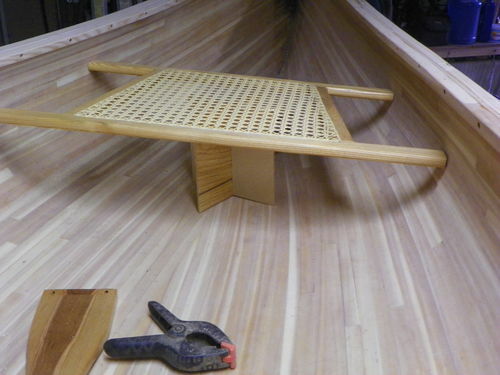 If I do I will poly the inside of the canoe. That ought to bring it around. As usual, if I do I will update. See you then. Very nice craftsmanship as usual. I do understand WHY the book says to wash the whole thing with water (to make sure there’s no dust anywhere) ... but I wonder if wiping it down with tack rags would work just as well? Oh, and the poly on the deck sure looks purdy ! Wow that was a close one. Great that you had a spare seat. You recover well . thanks for sharing. 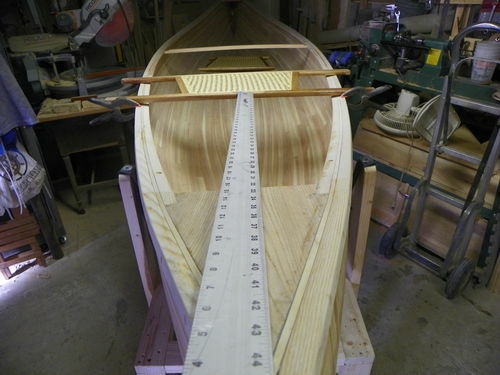 Oh man…a cedar strip canoe, this is one of my bucket list projects. Your work looks fantastic! Joe, I’m not sure about the tack rag. They work really well, but if it isn’t good enough I would have a mess on my hands. I’m not willing to find out. Thanks buddy. Thanks everyone, I appreciate your following, and nice comments.